Congratulations to the VALID research associate Katie Moore who recently passed her PhD viva on B-vitamins and the Ageing Brain. 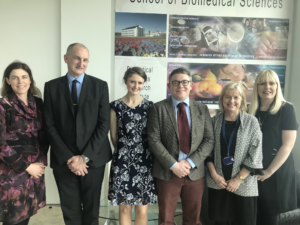 Special thanks to her external examiner Dr Tom Hill from Newcastle University, internal examiner Prof Chris Mitchell and Chair Prof Alison Gallagher. The VALID team in particular her PhD supervisors Prof Helene McNulty and Prof Mary Ward wish Katie all the very best in the new stage of her career as a Doctor!